Gifts for Creative People What is a Good Camera for a Beginner Photographer? This is How I Decided on a GREAT Starter Camera for Beginner Photographer after researching and waiting for my Must Haves for 1 year. Read some of my Tips to Protect Your new Prosumer Camera and don’t do what I did to reck my last point and shoot camera. After the battery was charged, I literally started taking photos within 2 to 3 minutes, without even opening the manual. I was very happy about this. See the Highly Detailed Sony A6000 Review Video by Gary Fong. Amazing examples and lots of tips for shooting video and photos. I LOVE Characteristics of a typical Point and Shoot with the ability to take professional type Photography. This is what I have been waiting for. I know it takes time to learn how to become a photography, so meanwhile I need a simple and easy to use camera that I can grow into. For those of us who are used to a point and shoot camera, chances are you might be able to start taking automatic photos within minutes without even looking at the manual. To take advantage of the many features of these camera’s, you will want to read the manual. I was so excited to start using my Sony A6000 Camera because I was anxious to get into a better camera that I could learn cool photography techniques yet be able to easily use it until then. I needed and wanted Lightweight Interchangeable Lens Camera that had ALL the features I was looking for. If you have been looking for a great camera that you can also grow into yet easily shoot photographs in the Auto Mode, then this is a camera you may want to consider. If you are looking for a technical Sony A6000 Review, this won’t be it because as an Amateur Photography with a deep desire to become a semi professional photographer, I am helping people like me make a decision on a Starter Camera for Beginner Photographer. NOTE: Technically these are called Interchangeable Lens Camera and not a DSLR Camera. For purposes of helping people who are looking for DSLR cameras and not aware of these newer lightweight mirrorless camera’s I might refer to them occasionally as a DSLR, Interchangeable Lens Cameras and Mirrorless. The former two being the proper name. Read my Sony A6000 Reviews and see the most important Mirrorless Camera or DSLR Must Haves LIST Below. This is the List of Features that I was waiting for as a prerequisite to purchasing. I am very fortunate to have many electronic geniuses and semi professional photographers in my family to ask advice that I am now sharing with you. I wish I could have purchased the bundle that I am recommending but I was in a super rush and bought as soon the Sony A6000 Release Date to have for my trip. Within 2 to 3 minutes I was taking photos without opening up the manual. I didn’t look at the manual on purpose so I could give you and accurate Beginner Review from a Non Techy and Non Professional Photographer View. It has the basic point and shoot type controls that I am familiar with right on the top. When I was ready to shoot video, I did however need to look at the manual to locate the button to push to start and stop the video. Fortunately for me, I have a lot of camera buff’s, semi-professional photographers and tech geniuses in my family who I seek advice from when it comes to Cameras and Computers and technical products. My oldest brother has been recommending the Sony Cameras for years and I have been extremely happy with them. Now Sony has taken a BIG Leap into the Mirrorless Lighter Weight Interchangeable Cameras. 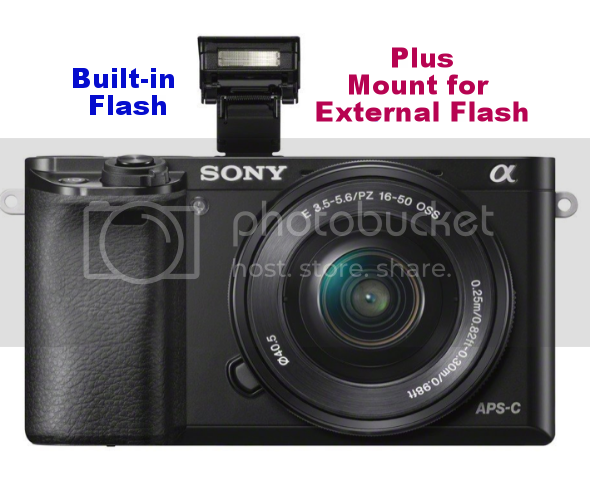 IMPORTANT NOTE: The Sony New Mirrorless Camera is Sold as a BODY ONLY Camera and in a Variety of Sony A6000 Bundle Kits. Often times the Bundle Kits don’t come with the Best Accessories for Cameras but they are a much more affordable way to dive into the Prosumer Line of Cameras and later on you can purchase higher quality Lenses and other Accessories. If you want to go straight to Amazon to see the Camera that I bought, here is the Link * * * CLICK HERE for more Details and Price Sony A6000 Camera with 16-50mm Power Zoom Lens . 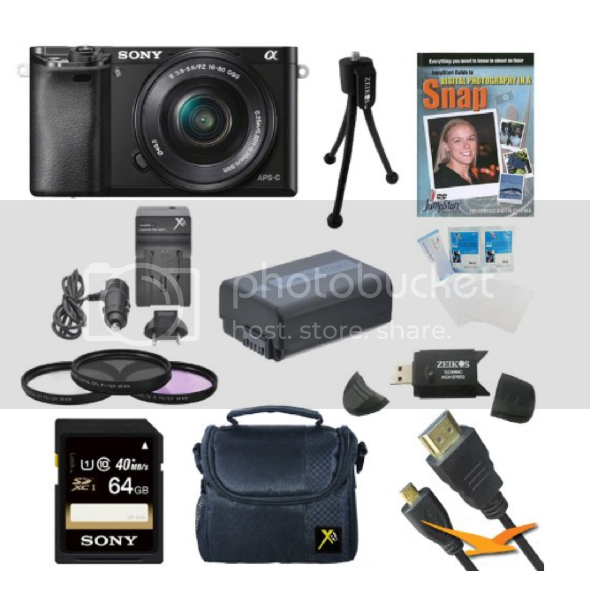 But you will get much better value with the Sony A6000 Bundle Shown Below. 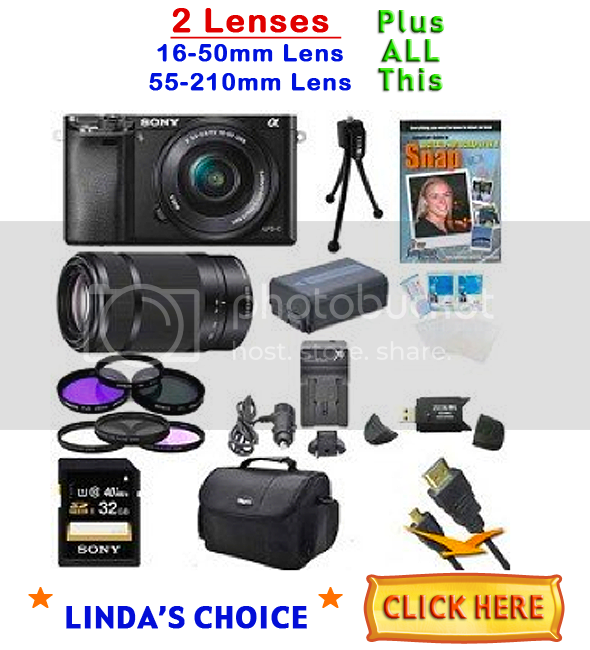 See “Linda’s Choice” BELOW for one of the Best Camera to Buy for the Money. Same great camera just a better Bundle VALUE for the beginner photographers. Best Beginner DSLR for Photography? Technically this is not a DSLR Camera but an Interchangeable Lens Camera and often referred to a a Bridge Camera. For practical purposes for newbies like me, I will at times refer to it as a DSLR Camera. Because many beginner photographers are looking for Lightweight DSLR Cameras and like I was, are not aware of the Amazing technology that Sony has brought to the world, the Best Mirrorless Camera for Beginners and Professionals. Best Mirrorless Camera Under 1000 Dollars? The following #1 to #3 Value Choices for the SONY Alpha A6000, Which of these is the Best Camera to Buy for the Money? This is a very close recommendation for me because it really depends on how serious you intend to become as a new photography and how much you can afford to spend at this time. 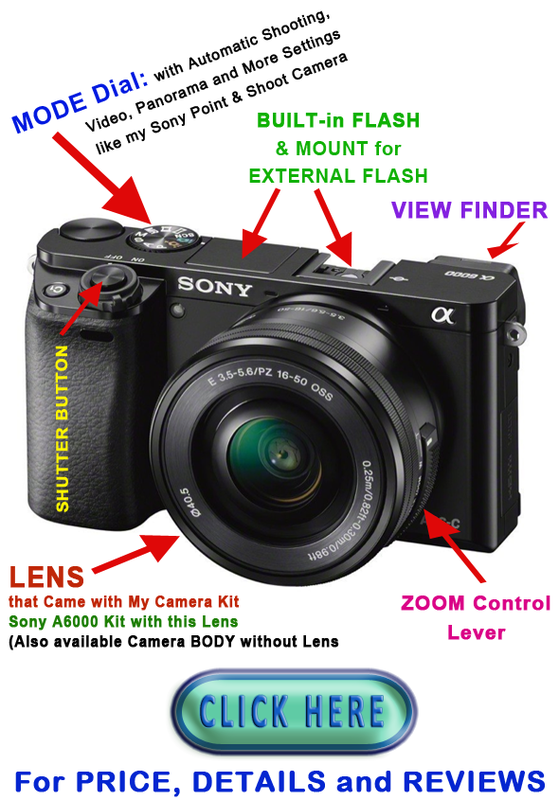 This is the Sony A6000 Bundle I wish I would have purchased because of all the Must Have Camera Accessories Included. Best Mirrorless Camera Under 1000 and the Best VALUE for your Money. Although there are better values that are over $1000, I think this is a great place to start. I wish I would have been able to wait and buy a Kit vs purchasing the accessories separately but I was in a huge rush and I needed to be guaranteed that the Camera and Accessories would be at my Son’s house in California buy the time I arrived. If I was willing to settle for the Sony A6000 Silver, time wouldn’t have been a problem but because of the potential of added reflection bouncing off the silver finish, I wasn’t willing to purchase the Silver finish Sony Camera. CLICK HERE to See LINDA’S CHOICE Sony A6000 with TWO Lenses in this Bundle . Outstanding Value. I wish I would have purchased this Bundle because of the TWO Lenses included. Because of my time restraints with my trip out to California to visit my son, I needed to buy directly from Sony because I definitely wanted the Black Sony A6000 vs the Silver because of reflections bouncing off the silver. My brother warned me about that. Learning about Aperture. Even though he is using a different camera, his teachings are very simple and he explains clearly. I didn’t even know what Aperture. Easy to Understand Photography Tutorials for Beginners by PhotographersOnUTube. Over a Million Views and almost 20,000 Likes. I find him easy to understand. This is the Camera and Lens that I bought due to the constraint of time. For about $30.00 more you can get this plus a lot of starter camera accessories. Look above for “Linda Choice” by the big Yellow Orange “CLICK HERE” Button. This is the Sony A6000 Bundle I would have selected. Just the Camera and the Lens. ONE 16-50mm Power Zoom Lens ($300.oo Lens if purchased separately). The Mirrorless Technology is why Sony can create a MUCH lighter Camera with such Awesome Video and Photography. It is a digital camera with Interchangeable Lens Mount for an array of Lens choices. Mirrorless Cameras are growing in popularity with the refinement of these cameras. Right now it comprises of 5% of all cameras purchased and shipped. The DSLR has been losing popularity starting in 2013. This is way beyond my knowledge. I just know this is a great lightweight camera due to being a Mirrorless Interchangeable Lens Camera and the Videos and Photography are awesome. Especially when you kick in the more technical features that I intend to slowly learn. The mirrorless interchangeable-lens camera (MILC) is a class of digital system cameras. This type of camera provides an interchangeable lens mount. They do not have a mirror reflex optical viewfinder. MILC cameras comprise 5% of total camera shipments. After a few years without a well-defined classification, many specialized pages and also major manufacturers are adopting the term DSLM or simply Mirrorless. This standardization in the classification of this group of cameras has been a growing need, since DSLM or Mirrorless has been incorrectly included in the category Digital Compact Cameras. Compact cameras have tiny sensors and do not exchange lenses. Being compact is a quality of DSLM and one of its strongest attributes, which has attracted a growing number of adherents to the system. The DSLM has been manufactured with complete various sensor sizes from 1/2.3″, 1/1.7″, 1″, Micro 4/3, APS-C and Full Frame sensors. And after 2013 DSLR downturn, in early 2014 many camera manufacturers, including Nikon released many MILC including the lenses. Sony has brought the Mirrorless Cameras to the forefront of ProSumer Cameras. I think one of the main reasons you might consider the Mirrorless Cameras are because they are so lightweight. If you have difficulty holding a camera for long periods of time because of back, neck, shoulder, hand issues or other physical limitations, then I would definitely consider a mirrorless interchangeable lens camera. If you will be taking it to your kids games, on vacations or work and will be carrying it for long periods of time, this would be another thing to factor in. You might want a lightweight camera because you shouldn’t leave it in a hot car. This is how I wrecked my last point and shoot camera and I had to wait until this camera came out to get another because the non mirrorless cameras were just too heavy and cumbersome for me. I was very excited to get my new camera. It is so new that I had to have it sent to my son’s house so I would have the camera for my trip to California. He opened it up for me and charged the battery so it was all ready by the time I get there. Because my visit with my son is so short, I didn’t want to take time to learn about the camera. I was told by a Sony representative that I will be able to pick it up and start shooting right away because this camera acts like an easy “Point and Shoot” Camera. I will let you know if this is a true statement or not. My Top 10 features I Want in a Camera. Other than taking about 2 to 3 minutes to set the Date and Time on my new and Best Sony Mirrorless Camera, I really was able to pick up the Camera and start shooting photos right away. The controls on the top were so similar to my Point and Shoot Sony Camera that I knew how to set those and it was easy to see which button was the shutter button. After researching Best Prosumer Cameras for beginners I decided on the Sony A6000 for several reasons. Number 1 Reason this camera met ALL of my needs and desires. As I have been researching cameras for about 1 year now, I kept finding camera’s that would meet most of my wishes my not all of them. Important features were missing for me. I am the type of person who will wait for what I am looking for because I keep things for long periods of time. The Sony Alpha A6000 is an Awesome Camera for both Amateurs and Professionals who want a lighter camera with the ability to shoot 11 to 12 Frames per Second and HD Video. WiFi to easily download your photos and videos and share in several ways. Amazing photography that can be used by novice point and shoot camera user who wish to learn how to become a semi pro to professional photographers. For the professional, you can use your lenses by buying the adapter. Sony offers an array of lenses from medium quality to high Carl Zeiss Lenses. At this time Sony does not offer as many lenses as Canon but no one at this time can shoot as fast as this camera and is as light as this camera is with this many amazing features. I absolutely love the fact that I could pick up my new Alpha Sony Camera and start shooting withing 2 to 3 minutes once the battery is charged up. The battery takes about 5 hours to fully charge. You will find this camera to be so similar to other point and shoot cameras that it will be easy to learn how to be an amateur photographer right away. Learning to use ALL the features and how to become a better photographer takes a lot of time. You can grow into this camera. This is such a good camera for new photographers because it works like a point and shoot that you are probably used to yet you can grow into the more complex features that you get with DSLR and SLR Cameras. Once the camera was charged up, I could start shooting images without even looking at the manual. I did that on purpose so I could tell you what I was able to figure on intuitively. When I wanted to shoot a video of my son playing football, I did need to look at where the Video Button was. Also very easy. Here is my very first video shot with my Sony A6000 Prosumer Camera. Here is my FIRST Video I shot the on my first day with my Sony A6000 Prosumer Camera. I think it turned out quite nice. The only thing I couldn’t figure out without looking at the manual, was where the Video Button was. It is located on the upper back/right side of the camera. It is a tiny little black button with a RED DOT in the middle. So easy, I just pointed the camera at my son playing football, push the video button to start and end the video. WOW! Sold through my Amazon Affiliate Links. Thank you so much for shopping with Little Linda Pinda.